The commission I’m working on is coming along nicely. I’ve been quiet about it, because I’ve basically been doing all the boring stuff – making up the board, priming it with gesso, layering up the base paint colour to get it nice, dense and solid. 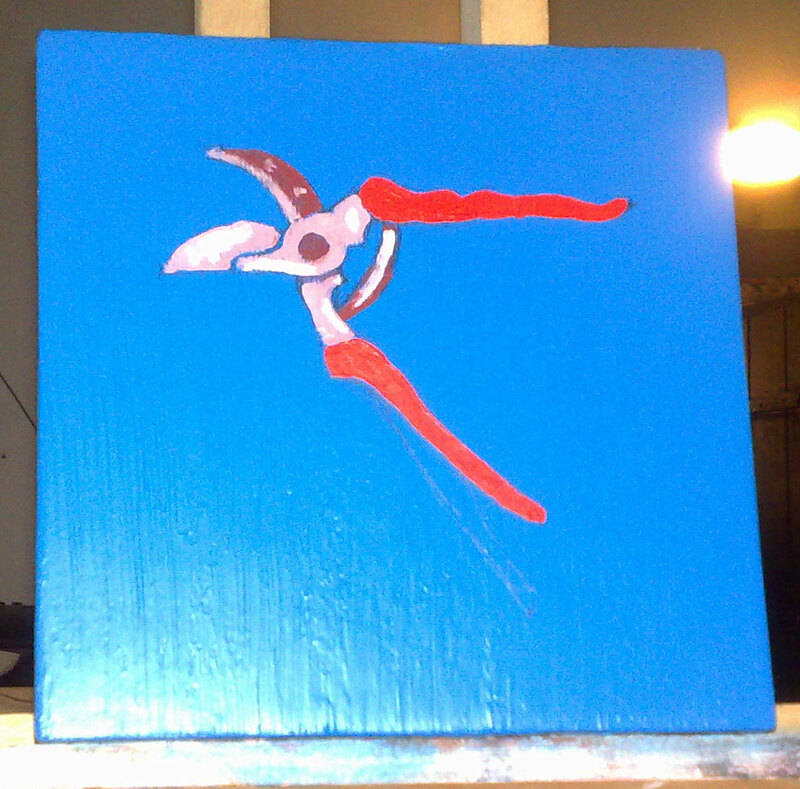 But today I started painting the main part of it – a pair of secateurs. The guy who commissioned me is a film maker called Rob. He came and filmed me in my studio at the end of last year, and really liked the works I had on my wall. He’s also a gardener, hence the secateurs. My old art teacher once told me Vermeer said that when you paint something you should “start with a brush and end with a pin”. So, you start with the broad brush strokes, and get progressively more detailed as you go on. Art teachers are full of nonsense like that. So I began with the bigger brush, and got something that I was reasonably pleased with. Having got this far, I thought it best to leave it, sleep on it, and come back to it tomorrow. Besides, it was so cold, my hands were shaking. That was when I took the photo above. However, I couldn’t resist, picked up a smaller brush and cocked it up a bit. Nevermind. Fortunately, I’m using acrylics, which are quite easy to overpaint. They dry really quickly. I’ll return to it tomorrow with warmer fingers and renewed vigour. A word about acrylics. Please don’t ever ever EVER buy Rowney or Windsor and Newton acrylics. If I hear you even mention the word Spectrum, I shall never speak to you again. It’s alright, we’ve all done it, but you must repent. If you use Liquitex, then do so very quietly in a corner, but if I find out about it, there’ll be trouble. There is one name, and one name only, in acrylice paint, and it is Lascaux. Lascaux acrylics are colourfast (I mean REALLY colourfast), nice weight on the brush, deals with watering down much better, and the gloss and matt mediums are MUCH more fluid and better than anything else. I get them from Fitzpatrick’s in Cambridge Heath Rd., London. I think they’re pretty much the only UK stockist (Lascaux are Swiss).